IS THERE A TWIN LANGUAGE? This is the second in a series of articles on MBC. Past research as well as research conducted by Dr Sandra McMahon at the University of Queensland suggests that multiple birth children have unique requirements in order to assist them to develop to their optimum communication development. Does the speech of children within MB sets sound the same and function at the same level? – Do they have their own language? Should the MBC be separated so that individual attention can be given to each child? Why should the communication development of MBC be any different from any other children? How can we help their communication development? This article aims to discuss Question 2 – Does the speech of children within multiple birth sets sound the same and are they functioning at the same level? – Do they have their own language? Past researchers originally linked the genetic base of the MBC to how similar the children would be. As you are probably aware twins can be identical, where one egg splits into two so that the children have the same genetic make-up; or two or more eggs can be released so that fraternal children with different genetic make-up occurs. Researchers hence predicted that if communication skills are genetically based, children with the most similar make-up (i.e. identical twins) should be ‘most’ similar in their communication development. Unfortunately no conclusive answers as to whether identical twins were more similar ·than fraternal twins has been found in the research over the years. Opinions differed depending on what communication skill they observed and what methodology they used. Some researchers did claim however that MBC used a unique language that only the MBC in the set could understand – i.e., it was thought that MBC had their ‘own language’. The figure of 40% of MBC having their own language is often bandied around in the literature. However, any descriptions or evidence of these ‘unique’ languages are very poor and many other researchers report that such unique languages really do not exist. My research aimed to look at the similarities and differences between siblings within multiple birth sets and to investigate the legitimacy of the claims of them having their own languages. 19 sets of MBC were looked at in this particular study. There was no statistical difference between siblings in a set for any of the communication skills such as grammar, vocabulary and use of language i.e., they were basically at the same developmental levels. However for grammar frequently one child in the set was very slightly more advanced (their sentences were more mature). The speech of the siblings within multiple sets was very similar. If one child had speech problems such as a phonological delay (i.e., slow at learning the rules of putting sounds together to form words) so did the other child in the set for all but two sets of the 19 sets. 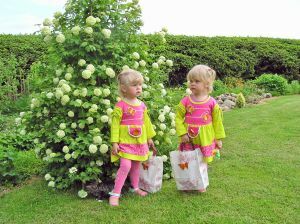 While multiple birth siblings had similar speech errors, their speech was not identical as perhaps would be the case if they were using their own language. Why was the speech not identical? One child in a multiple birth set tended to use more phonological processes than the other(s) i.e., one child had more severe speech issues than the other(s). Frequently there were speech errors that all the children in a set used but ALSO each child in the set also used errors that the others in the set did not use. It was found that MBC use a higher percentage of unusual processes than singletons. As unusual processes (such as changing the vowel sounds in words, starting all words with the /d/ sound) are not heard frequently in most developing children, they make speech more difficult to be under­st00d by adults. This could be misinterpreted that the children are inventing words rather than acknowledging that it may in fact be a speech disorder where they are using the incorrect speech rules. If MBC had their own language you would expect them to understand each other’s context free speech at least as equally as well as they understand adult speech. But this was not the case in the research conducted by Dr McMahon. The MBC understood adult speech far more easily than their sibling’s speech. In fact the MBC only found it easier to understand their sibling’s unusual speech the more closely it sounded like adult words. However, MBC were able to understand their sibling’s speech better than other children of their own age hinting that there is a strong familiarity between the children within the set. It may be rather than them having their own language, it is that they spend a lot of time together making them more familiar with each other. It perhaps could be likened to a husband and wife that has spent a lot of time together – often they can “guess” what the partner is likely to say or finish each other sentences off. So in summary, Yes the speech of children within a multiple birth set are very similar although one child may be very slightly better with grammar, intelligibility of speech and how they use their language. There is no “real” evidence that MBC have their own language although it is easy to see why this belief has developed. Their development is similar, they often share some unusual phonological processes and hence may say some words in the same ‘funny’ way and they do seem to understand each other better than other children they are playing with. Perhaps rather than “twin language” their speech is characterised by speech difficulties. In view of the high percentage of speech errors observed in twins and triplets if they seem to have unclear speech, investigation and support may be warranted. This leads to the questions as to whether the multiple birth children should be separated so that their speech problems are not reinforced by each other. The pros and cons of this is discussed in Article 3.